For individuals who cannot hold or do not wish to hold an Alberta Driver’s License, an Alberta ID card is available. The cost is $49.95 for a five-year term. The minimum age to hold an Alberta ID Card is 12 years old. Applicants under the age of 18 must bring a parent or guardian with them in order to apply. You cannot have both an ID Card and a Driver’s License (from any jurisdiction) concurrently. If you have an ID Card and then upgrade to a Driver’s License, a pro-rated amount remaining on the ID Card will be applied to the Driver’s License. To apply for or to renew an ID Card, you must come into the registry in person – you cannot authorize another individual to come in on your behalf. 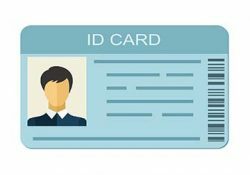 If you are applying for an ID Card for the first time or if your ID Card has been expired for 6 months or longer, you will need to provide government-issued photo ID, proof of residence and proof of legal entitlement. Click here to see acceptable support documents to bring with you. Click here to see acceptable support documents to bring with you. Have you lost your ID Card? We can order a duplicate ID Card for you. The cost is $22.45. You will have the same photo as before but you will have to sign for the card. Please bring in alternate ID (i.e. birth certificate or passport and at least two pieces of mail) we can verify your identity.